Secluded luxury accommodation in Regent St just a 2 minute stroll to The Square. 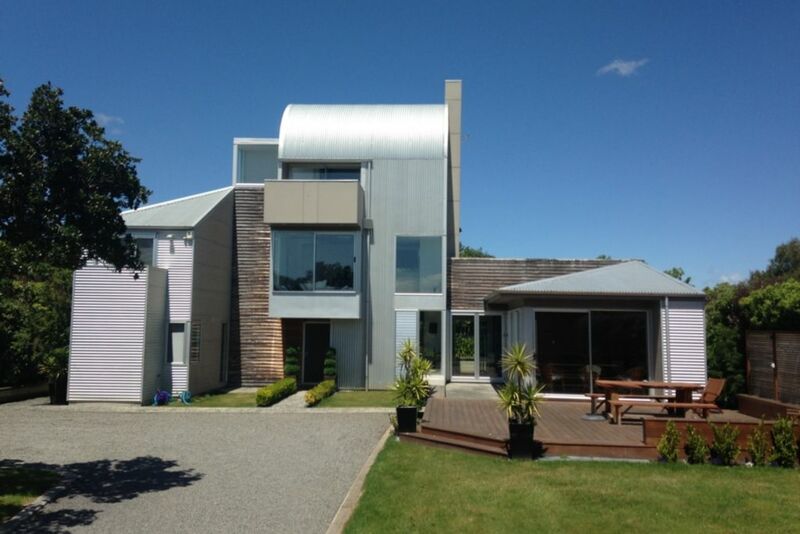 This Ultra Modern, controversial, architecturally designed Martinborough home recently featured in NZ House and Garden magazine. Prepare your breakfast in the well equipped ultra modern kitchen and relax and enjoy it in your own private sunny courtyard. In the evening sample your local wine purchases as you BBQ and take in the fabulous sunset and rural views from the large secluded first floor outdoor courtyard. The Luxury master bedroom includes a Super King bed, an executive double spa bath and double shower and boasts the best views of Martinborough and South Wairarapa from your own private balcony. The three other double bedrooms are all well appointed and include queen size beds plus make up mirrors and lights. This modern home provides double glazing, luxury interior furnishings, air conditioning plus heat pump and under-floor heating. Unlimeted Wireless Broadband, an entertainment/audio system, Samsung 50" flatscreen with Sky (Sport and Movies) is available throughout the house. The natural beauty of the Southern Wairarapa region and slower pace of country life is the perfect setting in which to indulge or simply chill out and relax. Should you feel a little more energetic, the Martinborough Tennis court are right across the road (racquets available) or explore and sample international award winning wines from the local vineyards. Stop in at the famous Martinborough Square with its many restaurants, bars, cafes, boutique shops and Cinema. We stayed at Regency on Regent with 4 adults and 4 children. The property was perfect, clean and well equipped. Would stay again. Best property I’ve stayed at! Best property I’ve stayed at! Can’t recommend enough! Great for large numbers however it would have been 5 stars if it had an additional bathroom or toilet on the middle floor. Fabulous house to stay. We were a large group and the house catered for all our needs. We enjoyed the many different areas to escape to. The outdoors was lovely to have our meals and for the children to play. Kitchen is very well equipped with 2 sinks being very handy. The only downside is the bathroom upstairs. Hard for the middle level guests to use as yu have to go through the bedroom to access it.. Consequently most of the guests have to use the downstairs bathroom. Recommend highly. Amazing house, amazing facilities. Loved the kitchen & the spa bath. Entertainment was a breeze. Our guests loved their stay. It was wet weather while we were there, but it didn't matter as the house was so comfortable.